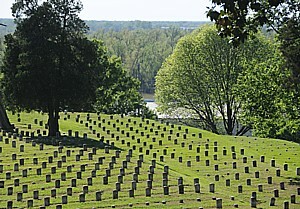 The Epic Civil War Journey sails the historically-rich waters of the Mississippi and Tennessee rivers, with a number of fascinating ports of call along the way allowing passengers the opportunity to explore the famed locations and battlegrounds that shaped the future of the United States of America. Passengers will sail aboard the newly-refurbished American Queen steamboat, which will premiere “This Republic of Suffering,” the latest production by American Experience, weeks ahead of its national debut on PBS stations across the country. Based on the best-selling book This Republic of Suffering: Death and the American Civil War by noted historian and Harvard University President Drew Gilpin Faust, the highly-anticipated documentary examines how the unprecedented death toll of the Civil War challenged American cultural attitudes about death and changed federal government policies regarding soldiers. Passengers join Emmy Award-winning filmmaker Ric Burns and acclaimed producer Mark Samels as television’s longest-running and most-watched history series American Experience presents the Epic Civil War Journey. Burns, Samels and other special guests will share their vast knowledge, premiering and discussing the upcoming PBS production with passengers aboard. Combining learning, luxury and leisure, this sailing will truly be unlike any other. Ric Burns has been writing, directing and producing historical documentaries for nearly 20 years. He is best known for his epic series New York: A Documentary Film (1999-2003), which premiered nationally on PBS to wide public and critical acclaim as an eight-part, seventeen and a half hour film that chronicles the city’s rise from a tiny Dutch trading post down through its continuing preeminence as the undisputed economic and cultural capital of the world. The first episodes earned the prestigious Alfred I. du Pont-Columbia University award for excellence in broadcast journalism, an Emmy for outstanding achievement in non-fiction editing, and two other Emmy nominations, for outstanding non-fiction special and achievement in cinematography. In 2002, episode seven of the series was awarded the American Cinema Editors award for best edited documentary, as well the Cine Golden Eagle Award. The eighth and final episode received an Emmy and an Alfred I. du Pont-Columbia University Award, among other awards. Burns began his career collaborating on the celebrated PBS series The Civil War, (1990), which he produced with his brother Ken, and wrote with Geoffrey C. Ward. Since founding Steeplechase Films in 1989, he has directed some of the most distinguished programs in the award-winning public television series, American Experience, including Coney Island (1991), The Donner Party (1992), The Way West (1995), Ansel Adams (2002) and Eugene O’Neill (March 2006). Most recently he wrote, produced and directed Andy Warhol for the PBS series American Masters (September 2006). For his work on Andy Warhol, Burns was awarded a 2006 Peabody Award, and a 2006 Primetime Emmy Award. Burns is co-author, with James Sanders and Lisa Ades, of New York: An Illustrated History, the companion book to the New York series, as well as co-author, with Geoffrey C. Ward and Ken Burns, of the companion book to The Civil War. Both books are published by Alfred A. Knopf. Burns was educated at Columbia University and Cambridge University. Mark Samels is executive producer of American Experience, PBS’s flagship history series. Produced by WGBH/Boston, American Experience is television’s most-watched and longest-running history series. Under Samels’ leadership, the series has been honored with nearly every industry award, including the Peabody, Primetime Emmys, the duPont-Columbia Journalism Award, Writers Guild Awards, Oscar nominations, and Sundance Film Festival Audience and Grand Jury Awards. Samels has overseen the production of more than 100 films for the series, focusing on stories from America’s past that are highly resonant in the world today. He has expanded both the breadth of subjects and the filmmaking style embraced by the series, allowing for more contemporary topics and more witness-driven storytelling. In addition to his public television work, Samels is a founding member of the International Documentary Association and has served on the Academy of Television Arts & Sciences Nonfiction Peer Group. Crown Cruise Vacations and Artful Travelers are presenting this educational PTV at Sea adventure, celebrating PBS’ award-winning history series American Experience in luxury, aboard the newly refurbished American Queen. Epic Civil War Journey Voyage Fares special promotion fare ranges from $2,895 to $8,495, depending on the cabin category and number of guests. To participate in all exclusive Epic Civil War Journey events and activities, reservations must be made directly with Crown Cruise Vacations by calling toll free 855-788-7880. Fares include a complimentary one-night luxury hotel stay both before and after sailing, complimentary shore adventures, complimentary multiple dining options, complimentary beverages, including wine, beer and spirits and much more. Contact Crown Cruise Vacations, exclusive provider in partnership with Artful Travelers, promoters of PTV at Sea cruises. Reservations can be made directly with Crown Cruise Vacations by calling toll-free 855-788-7880 (USA/Canada) or emailing ptvinfo@crowncruisevacations.com.